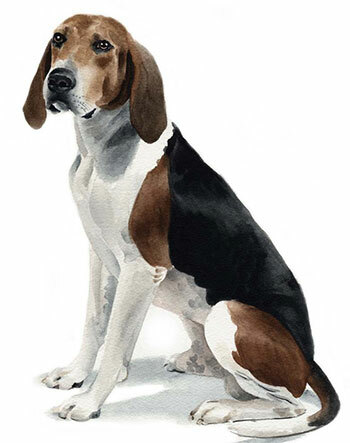 A true Southern U.S. dog, the American English Coonhound loves to hunt. Loud-voiced and hard-working, the American English Coonhound is one of six official Coonhound breeds. Renowned for its speed, endurance, intelligence, and athleticism, this dog loves to be on the move. Good with children and friendly with strangers, you’ll find this dog to be fairly easy to train, making it a great family pet for novice owners. It will alert you of strangers entering your property, but will make fast friends with anyone who gives it attention. This makes the American Coonhound a good watchdog, but not the best guard dog. Evolved as a descendant of the English Foxhound, the American English Coonhound is a natural-born hunter. Loving barking and hunting rocky and natural terrain, this breed is a loud athlete. A pleasant and nice pup, he's sociable to both humans and animals. Alert, confident and friendly to people and dogs, the American English Coonhound fits in well with a variety of households. Active owners will find that it makes a wonderful companion, especially if you like to spend time outdoors with a high-energy pet. Although not suited to apartment living, this breed loves to be with its people and will thrive in a loving household. If this is the first time you’ve heard of the American English Coonhound, read on – this dog may just be the perfect fit for your family. The breed traces its ancestry from Foxhounds brought to the United States by European settlers during the 17th and 18th centuries. 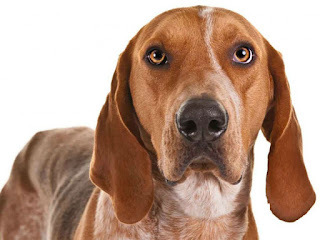 It shares a common ancestry with all other coonhounds with the exception of the Plott Hound. The breed developed from the "Virginia Hounds", which were developed over time from dogs imported to the United States by Robert Brooke, Thomas Walker and first President of the United States, George Washington. The dogs had to adapt to more rigorous terrain, with the breed being specifically bred over time to suit these new conditions. They were used to hunt raccoons by night and the American red fox by day. 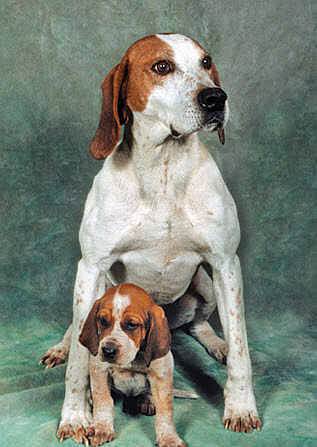 It was recognized by the United Kennel Club (UKC) in 1905 as the English Fox and Coonhound. 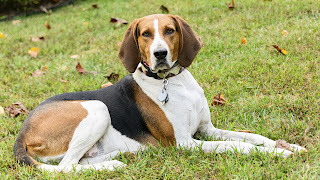 The Treeing Walker Coonhound was recognized separately by the UKC in 1945, splitting it off from the English Fox and Coonhound breed. 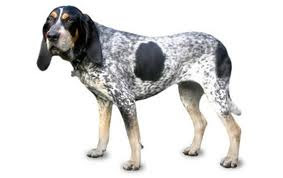 The following year the Bluetick Coonhound was also split. The breed was accepted into the American Kennel Club's Foundation Stock Service as the American English Coonhound in 1995. It was moved up to the Miscellaneous Class on 1 January 2010. Following the recognition of the breed by the AKC in the hound group on 30 June 2011 as the 171st breed,the American English Coonhound became eligible to compete in the National Dog Show in 2011 and both the Westminster Kennel Club Dog Show and the AKC/Eukanuba National Championship for the first time in 2012. English Coonhounds are energetic, intelligent and active. Loving and eager to please their owners, their great senses make them excellent hunters. 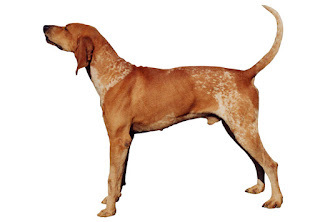 This breed is an extremely fast, hot-trailing competitive type coonhound. Very devoted to its family, it makes a good companion dog. It does well living indoors and plays a fine guardian to his family and home. They are usually best with older considerate children, but can also do well with younger ones. Without proper human to canine leadership and communication some can be a bit dog-aggressive and/or develop behavior issues. They need owners who are firm, confident and consistent with an air of authority. Socialize this breed well, preferably while still young to prevent them from being reserved with strangers. Do not let this breed off the leash in an unsafe area, as they may take off after an interesting scent. They have a strong instinct to tree animals. Without enough mental and physical exercise they will become high-strung. The American English Coonhound needs a kind but firm hand for successful training. In order to make headway, owners should maintain calm, confident, consistent authority as leader of the pack. 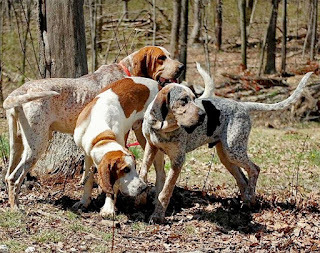 This breed may require more time, repetition and patience than other Coonhounds to reach the owner’s training goals, because it tends to be more easily distracted than its Coonhound cousins and likes to learn at its own pace. Some American English Coonhounds find it difficult to focus on anything but hunting and treeing other animals. Those dogs need extra motivation to learn their manners and basic obedience skills. Without steady, consistent, gentle guidance, this breed can develop undesirable traits such as dominance or excessive shyness. Socialization and training should start at an early age and continue for life. No surprise here – the American English Coonhound has lots of energy to burn. This is high-energy breed needs plenty of daily exercise. If you’re an active owner, make your American English Coonhound a jogging or biking partner. As a family, you can enjoy playing games such as fetch and hide-and-seek with your dog, along with long brisk walks. Another idea to consider is to get active in competitive outdoor canine sports, including field trials, tracking, agility and obedience. There are organizations that put on events such as night hunts, water races, field trials and benched conformation shows. Hunters will find faithful companions in the American English Coonhound – this dog is an energetic hunting and will happily carry out all the hunting duties it was bred for. Of course, if your American English Coonhound doesn’t get enough exercise, it can become bored, depressed, frustrated, anxious or hyperactive. On top of all of that, these dogs can become destructive. To ensure that the American English Coonhound is happy, you’ll need to provide plenty of mental and physical stimulation. If you don’t have enough time to exercise and socialize this dog, you should consider a different breed. The American English Coonhound needs room to run around in, so they do not do well in apartments, condominiums or houses without fenced yards. The American English Coonhound needs a fenced-in yard, where there is room to run. The American English Coonhound's short, close-fitting coat is easy to care for. This certainly is not a breed that requires religious grooming or meticulous trimming. However, they do shed quite a bit throughout the year and should be brushed regularly to keep household hair build-up at bay. A thorough brushing once a week with a clean, firm-bristled brush should suffice. Coonhounds don’t need to be bathed very often. Usually, they only require a good shampooing after they have romped in mud puddles or otherwise had a particularly eventful frolic in the out-of-doors. Of course, a bath is an excellent idea after a Coonhound is sprayed by a skunk or rolls in any of the wild animal or livestock feces that they find so appealing. It’s a good idea to brush them before their bath, to minimize the mess caused by excess dirt and hair. Owners can discuss a dental care regimen with their veterinarian. They should clip their Coonhounds’ nails monthly, or as often as necessary to keep them fairly short and tidy. Perfect for an athlete, this dog will keep you company on long runs. Loving other people, he would be a good fit in a family or an active single person's best friend to tag along on car rides. Best for people who live on lots of land, this dog might disturb neighbors with his loud howling and barking. Easy Training: The American English Coonhound is known to listen to commands and obey its owner. Expect fewer repetitions when training this breed. A real-life alarm system, this breed will wake you up in the morning. After sharing breakfast, he's ready to go on a daily run with his owner. Stopping to sniff out possible raccoons, he may even chat with anyone you meet as you run your usual route. Coming home for a nap, he'll engage in after-school play as soon as the kiddos arrive. Tuckered out at the end of a busy day of exercise and play, he'll lounge around and drool while listening for possible visitors to greet with a bark.